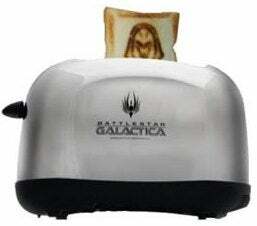 Praise the gods, our shiny Battlestar Galactica toaster arrived this week. Besides the hilarity of being a real-life frakkin' toaster, it also burns the face of a Cylon centurion right into the bread. I decided to put this scifi kitchen appliance to the test in an epic battle between the Sunbeam classic toaster and the Cylon super toaster. Click through to see the results. Could this new kitchen nugget triumph against the old faithful Sunbeam? They were both rigorously tested against the traditional starch fare - both white and wheat bread. In both rounds, the Sunbeam had a respectable showing against the new Cylon toaster. They both toasted bread at the same speed and with the same consistency, but of course the BSG toaster produced burned-in faces of centurions, and unless the Sunbeam suddenly started making the face of Jesus appear in the warmed bread, old Sunny was destined to fail. There was almost a major upset in the toast-off when Pop-Tarts were thrown into the mix. The tasty frosted brown sugar and cinnamon breakfast treats were a colossal fail for the BSG toaster; no matter how high or low you set the heat, the centurion face could not live up to the gooey frosting and it went down like a lobotomized Raider. Thankfully, no-one really cares about Pop-Tarts anyway. It was good to see the Sunbeam give the Cylons a run for their money, but in the end a regular toaster just ain't no frakkin toaster. Now, can we please get started on the sonic screwdriver drink mix?